Decorative Hops are For Sale Direct From The Hop Garden. 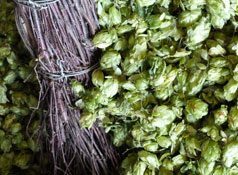 During hop picking (1st September for two weeks) we sell lots of green hop bines direct from the hop garden in Puttenham. 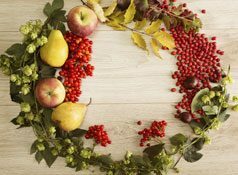 Our decorative hop garlands are easily used for flower decoration, harvest festivals and wedding venues during this period. The 12 foot garlands look extremely attractive and provide a year round dry flower display. 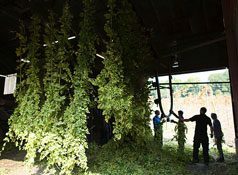 Bought fresh the hops dry naturally in situ and can either be augmented with other dried flowers or used by themselves. 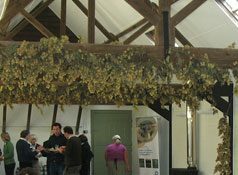 The hop bine has a string running through the centre for easy fixing but needs to be put in place as soon as possible after purchase to avoid deterioration. The aroma of a freshly strung hop is intoxicating, and gently fades over the first month. As many old wives tell us, ‘A hop in the house and you never go poor’.